You can really enhance your image by choosing the right color of archival mat board! Use the following information to make the choice that is right for your piece, your tastes and your decor. 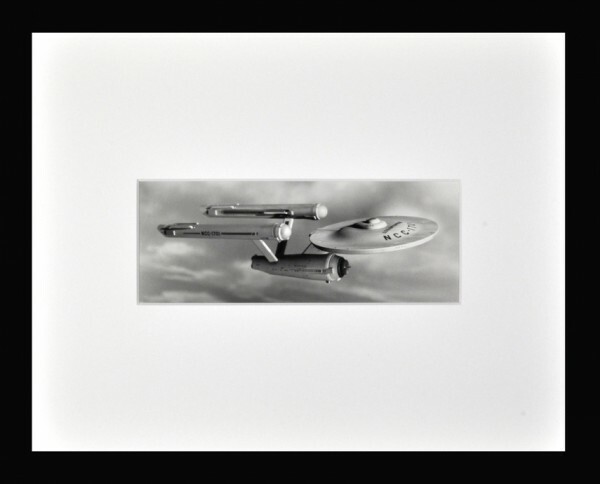 As mentioned in the first blog in this series on Matting – entitled “Good Mats / Bad Mats” – I’m using an old press photo of the Enterprise from Star Trek to illustrate the steps involved. All the tricks and tips I apply to THIS image can be applied to anything YOU’RE matting from YOUR archive of family photos / collections / art portfolios. While there are some “standard practices” regarding mat board color choice (i.e. 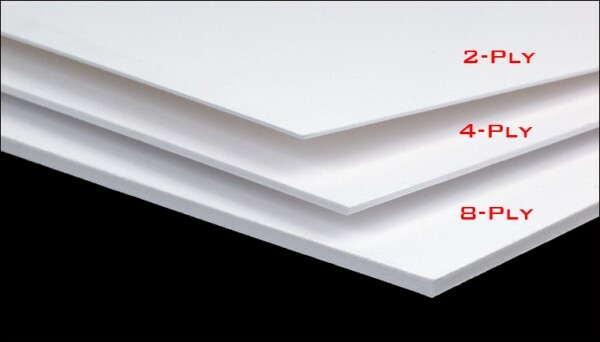 use a slightly “warmer” or natural white colored mat board for color or sepia-toned work / use a bright white mat board for black & white artworks or photographs, etc. ), personal preference really does come into play based on the image itself / your tastes / the decor of the room in which you’re planning on hanging a framed piece. 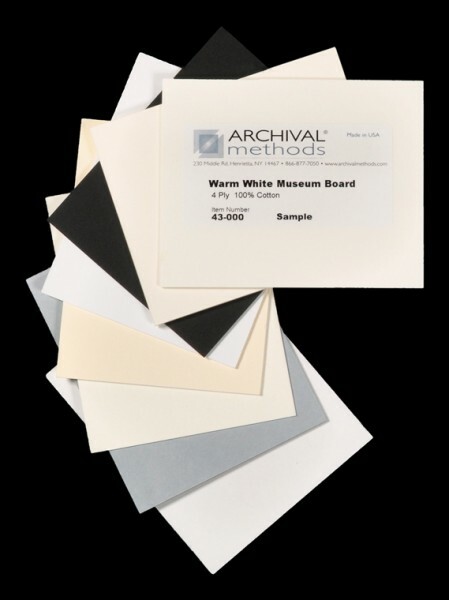 The best way to determine which archival mat board fits ALL of these criteria is to use a Mat Board Sample Kit (see photo below). So, with a Mat Board Sample Kit in hand, place each color sample next to the piece you wish to mat and decided which color best enhances the work / matches your tastes and decor. 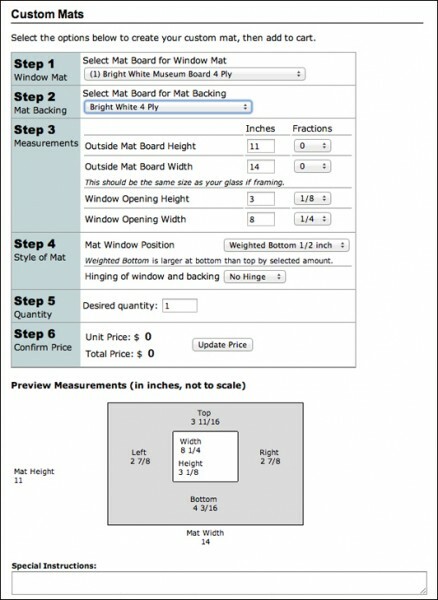 For the next step, select the “thickness” of the mat board you would like to use. While a 4-ply window mat hinged to a 4-ply backing board is often considered “standard practice,” your piece might warrant an 8-ply window mat for an extra sense of “presence,” or if you’re matting a rather large piece (20 x 24″ and up). By the same token, some people prefer to use a 2-ply backing board for smaller pieces (8 x 10″ and smaller), but NEVER use a 2-ply front window mat! These options really do offer you a number of choices, but when in doubt go with the “standard” 4-ply window mat hinged to a 4-ply backing of the same type of mat board. This is ESPECIALLY important if you’re matting your artwork or portfolio for presentation to a gallery / for a job interview / or to a college or grad school admissions department, as consistency will make a difference in all of those instances, and EVERYONE will expect it. When you have decided on the color and thickness of the archival mat board you wish to use, select those choices in the drop down boxes in the areas marked Step 1 & Step 2 on your Custom Mat Cutting template (see screenshot below). Boom! You’re on your way! The next step is to determine the exterior dimensions of your mat and the interior dimensions of you mat’s window. For an understanding of how best to determine those measurements, please click here. If you would like to learn more about the differences between a “good” mat and a “bad” mat (see photos below) / how to measure your mat / what is the difference between a “centered” or “weighed” mat / and what hinging is all about, please visit the other short yet informative blogs in our Matting series for a deeper understanding of each step of our easy-to-use Custom Mat Cutting template. The overall goal of our Matting series is to take the mystery out of enhancing your family photographs, collectible images, or your art portfolio – leaving you with a stunning, archivally matted presentation and the peace-of-mind that comes with knowing that you’ve done things right! This series will be followed by a similar set of blogs that will explain everything you need to know to mount your work in your new mats. Stay tuned! If you have questions or would like more information on matting or on the archival storage and presentation materials that are right for you, please contact us here at Archival Methods. We’re always there to help with any archiving, storage, or presentation questions you may have. We would also like to encourage you to follow us on Twitter, Facebook and Pinterest for up-to-the-minute information and stories of interest.